Former President George H.W. 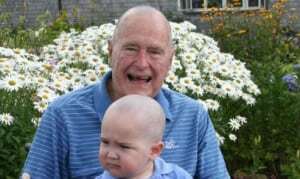 Bush shaved his head to show support for a two-year-old suffering from leukemia, according to Politico. Patrick, surname withheld, is the son of a member of Bush's security detail. Upon seeing several Secret Service men had elected to shave their heads in solidarity with Patrick, Bush took the step as well. A feel-good story has legs, especially one so personal. This is a point that William B. Horne, president and CEO of Truist, drives home in his chapter in PR News' "Guide to Best Practices in CSR & Green PR, Vol. 6" guidebook. "Consumers should feel that your company is an integrated part of their community—even if you are a multinational corporation," Horne says. Here are 12 key questions to ask about your cause marketing program, courtesy of Horne. > Does the program help to differentiate your brand? > Is the program bolstering your company’s reputation? > Does the program engage and inspire employees and customers? > Are you publicizing your program through multiple channels? > Are you listening to feedback from key stakeholders? > Are you evolving and adapting the program on a continuous basis? > Does the program take advantage of your company’s strengths? > Are you following industry best practices? > Can you tie the program back to core business objectives? > Do you have buy-in from senior management? > Are you using the best technology tools for the job? > Are you keeping on top of tracking, measuring and reporting your impact? Want to read more about CSR best practices? Purchase PR News' "Guide to Best Practices in CSR & Green PR, Vol. 6" in our online store today.